I’ve been bad. Very vary bad. Well, Blog wise that is. It’s not been one month, not two months, but three whole months since I last posted. It’s already March. The bunny season. SPRING. WTF is happening to 2011? Anywhoo, although I did take a break from blogging, I did not take a freak from WoW, well, except for a week in Feburary, but that was because I lacked internet. Oh, and I was in Vegas. More on that later. So Blizz came out with the Baby Moonkin Hatchling. I know you have all seen it. Its huge googly eyes. Its cute little moonkin dance. Its pint sized bundle of cuteness. Oh, and its $10.00 price tag. Thats whats stopping me. 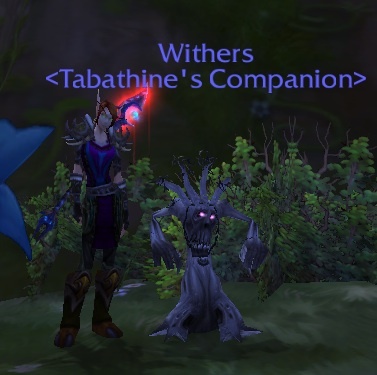 I am a WoW pet collector, Taba currently has 77 of the vanity pets, all of which I collected in-game, except for the Core Hound Pup which you get with the authenticator. And Davinna is a Druid, with the potential to become a Moonkin (atm she is spec’ed Resto, but her dual spec is blank). But see, there is a line I drew in some virtual sand that said I would not cross when I started playing WoW, promising myself that I would not pay more than 15 bucks a month towards this addiction. It will take my time, but dammit, it will not take my money! (WoW is pretty cheap as far as addictions go, I mean just look at the price of cigarettes). So far, with the exception of buying the expansion and the authenticator, I have held up. Recap! A lot has happened this last day and a half. Major MAJOR WoW stuff. Ok. Not even close to major. But each event got me really excited. Firstly, I created a priest. I always said that priests were one of the few classes that I wasn’t enterested in. I didn’t dislike them, but I didn’t like them either. Then Davinna dueled a Discipline Priest for well over 20 minutes before we finally called it a tie, and that got my attention. The Call to Arms is Warsong Gulch, so it’s the perfect time to create an alt. And my lvl 12 rogue, who I so wish I was good at, was irritating me. I actually made my priest as a trash toon, meaning I had no intention of working to lvl her, and just play her when I’m bored. But it turns out I LOVE being a priest. It just fits. The HoT’s and DoT’s, the look, and even the name. For me, naming a toon of mine is a big thing. Usually, once I decided on a race and class, I will muse, often times for days, over a suitable name. 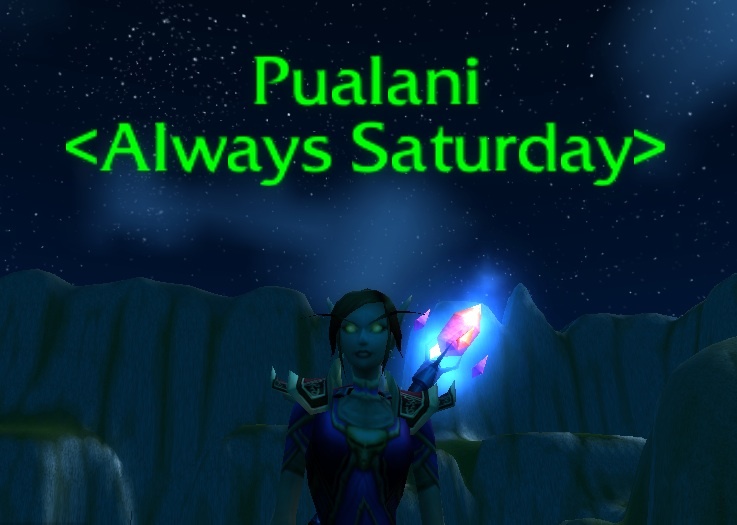 This toon I dubbed Pualani with barely any thought. And she is well on her way to level 23! I can’t believe I created her only two days ago. I love WSG weekends.